I'm not to worried about the optical drive... Lol who really uses disc drive anymore. Could I use a vista disc and reuse my windows validation code on the computer? Is this Vista disk one that has been installed on another PC? Is the Vista disk the same version as was originally installed on this system? It has to be a OEm version also if this is a branded system and then you have to use your key located on your system to install. If Vista is an OEM then you cannot install it on the machine in question as it is against the MS EULA for Vista. If the disk is a Retail version then you can install it providing you have un-installed it from the original machine. OK so the best thing to do would be to go with the suggested disc... Is that disc going to be compatible with gateway? Sorry if these question seem basic..
Do you have the Motherboard chipset drivers Disk? I'm not to worried about the optical drive... Lol who really uses disc drive anymore. You are buying windows 7, comes on a disk, so you will need a working drive to install it on your computer. mykyl, i do not, I'm actually not certain what info i need to know what chipset i have? ok well looks like this is now my computer to do with what i want. They said new Hdd and OS, keep it for your trouble. I think this will definitely be getting a seagate HDD. Is there anything thing i should look at while i'm in this system. Or should i wait until i have it running again? Also would you think that this Seagate HDD would be acceptable? Is there a way to test the CD/DVD rom drive before i get the other stuff as well because i'd like to make one order. Edited by flyboy1565, 07 February 2013 - 11:15 PM. You could try a Linux Live cd or even the Vista disk to see if it boots to the cdrom drive. Go into the BIOS and change the boot order to CD rom first. what info i need to know what chipset i have? When you buy a Motherboard, you get a disk with all the drivers needed for that boartd. When you buy something like the HP, it usually comes set up ready to use, OS and Drivers installed and recovery disks, you are lucky if you get a driver disk. This is about the best match I could find for your Board, FMCP7AM NB : NVIDIA nForce 730i rev B1; Warning, no guarantee they will work. I know you don't want to give up, but I think you a flogging a dead Donkey. Hahah thanks, I'm hoping to learn something other than how to waste money lol. I now know what a chip set is. in that regards, do I have to have that if I get a Windows 7 disc and a new he'd? ok what is that and is it free to try. I'm actually kind of interested in Linux since I've never really played with that system. Immediately start tapping the appropriate key to enter the BIOS, aka "Setup"
Once Puppy Linux has loaded, it is actually running in your computer's Memory (RAM). You will see a fully functioning Graphical User Interface similar to what you normally call "your computer". Internet access may or may not be available depending on your machine, so it is recommended you print these instructions before beginning. Also, double clicking is not needed in Puppy. To expand, or open folders/icons, just click once. Puppy is very light on resources, so you will quickly notice it is much speedier than you are used to. This is normal. Ready? Let's get started. 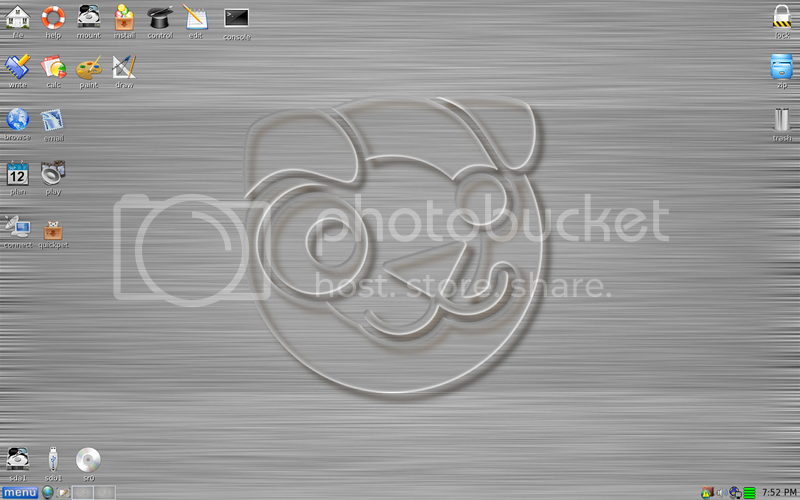 Click the Mount Icon located at the top left of your desktop. A Window will open. By default, the "drive" tab will be forward/highlighted. Click on Mount for your hard drive. Assuming you only have one hard drive and/or partition, there may be only one selection to mount. USB Flash Drives usually automatically mount upon boot, but click the "usbdrv" tab and make sure it is mounted. If using an external hard drive for the data recovery, do this under the "drive" tab. Mount it now. At the bottom left of your desktop a list of all hard drives/partitions, USB Drives, and Optical Drives are listed with a familiar looking hard drive icon. From your old hard drive, drag and drop whatever files/folders you wish to transfer to your USB Drive's Window. For The Novice: The common path to your pictures, music, video, and documents folders is: Documents and Settings >> All Users (or each idividual name of each user. CHECK All Names!) >> Documents >> You will now see My Music, My Pictures, and My Videos. Remember to only click once! No double clicking! Once you drag and drop your first folder, you will notice a small menu will appear giving you the option to move or copy. Choose COPY each time you drag and drop. YOU ARE DONE!!! Simply click Menu >> Mouse Over Shutdown >> Reboot/Turn Off Computer. Be sure to plug your USB Drive into another working windows machine to verify all data is there and transferred without corruption. Congratulations! If you're doing this to recover from a virus or malware infection, (or even if you're not), DO NOT copy executable files (.exe, .scr. etc...) if any of these files are infected you could be copying the corruption over to any new device/computer. just copy documents, pictures, music, or videos. I now know what a chip set is. in that regards, do I have to have that if I get a Windows 7 disc and a new he'd? The chip (hardware) is part of the Motherboard, you need the software (driver) to enable the motherboard to work properly. You have not answered some questions. Can you enter the BIOS and change the boot order to CD first? Good suggestion, also testes the optical drive. Yes I can enter bios. Gateway doesn't support this system anymore. Their site require you put in a service code number, which I have done put they only offer their forums which has no answers.